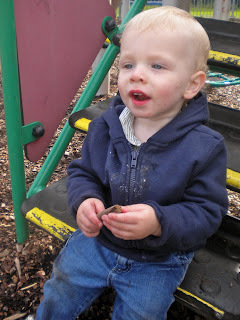 Today we stayed close to home and went to the park that is right around the corner. At 11 a.m. we went to the refectory for coffee. They served coffee, several kinds of cakes and biscuits. I had a really good cinnamon bun and the kids had biscuits, while Chad enjoyed the coffee. At 1:15 we went back for lunch. I am not sure what we had for lunch. It was some sort of rice and peas and a few other veggies. After lunch, the kids went down for a nap and Chad took the bus to Halifax to meet the vicar of his field education parish. He is not back yet, so we will report at a later date what that was like. Once the kids woke up we went to the park which is about a 2 minute walk from our house. You can see from the pictures that we finally had more sunshine than rain today, so we thought it would be a good day to check out the playground. 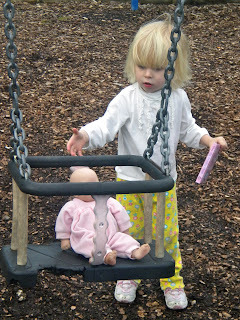 Caroline insisted that Zoe come with us and not just stay in the stroller, but really play with us! I could really tell that Caroline misses all her friends. When I told her we were going to play she said "I don't have any friends." When we got there, there were a couple girls hanging out, but they were probably 12 or so. They left and Caroline started to follow them. She cried when I made her come back and she kept asking me "where'd the girls go?" We definitely miss all our Sewanee buddies! Enjoy the pictures!